A complete set of CRIRES raw calibration frames consists of three dark exposures, a flat field, a wavelength calibration, and (optionally) a telluric and/or spectro-photometric standard star. Darks and flats are measured daily during daytime. Dedicated wavelength calibrations are normally only necessary for settings below 2500 nm. Standard stars are only observed on request. In addition to these calibrations, a series of darks and flats with increasing DIT is measured daily in order to assess detector non-linearities. These detlin calibrations apply to all settings. Dark exposures are processed in an elementary way without other calibration products. The same is true for detlin calibrations. Flat fields need a master dark product (CALPRO_DARK) with the same DIT and the detlin correction. The outcome of the flat recipe is a normalised flat (CALPRO_FLAT) and a bad pixel map (CALPRO_BPM). Both products are used by the wavelength calibration recipe in order to reduce fixed-pattern noise and to mask bad pixels which might be misinterpreted as spectral features. The normalised flat should have the same reference wavelength as the wavelength calibration; the bad pixel map can be from any setting. Science and standard star observations are processed with the same recipe. It uses a master dark, non-linearity correction, a normalised flat, and a wavelength solution. A dark frame is not necessary for observations in nodding mode. A wavelength solution can be skipped if enough sky lines are present in the science/standard exposures. 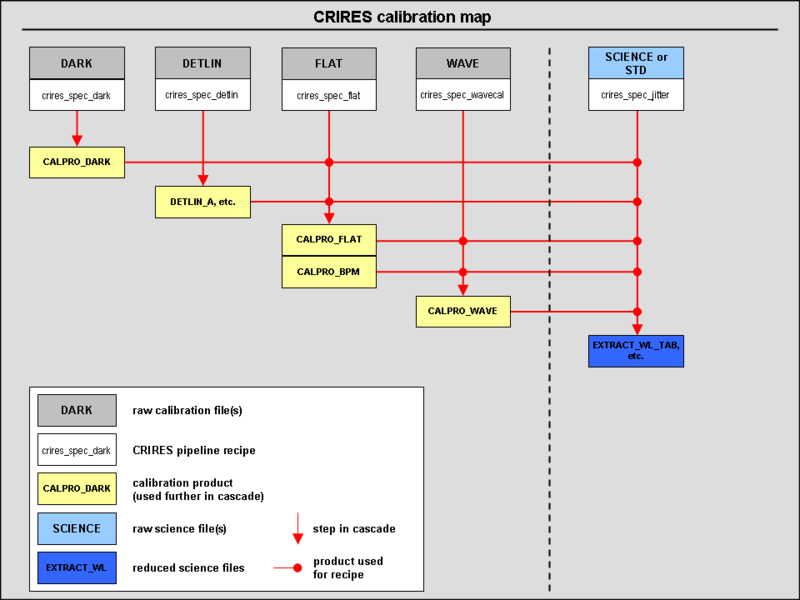 The calibration scheme for CRIRES is summarised in the map below. It includes only calibrations that are measured regularly. Static calibration tables like lines lists and flux tables for standard stars are not included. CRIRES calibration cascade [click for full view]. Raw calibration files are described here. Calibration products are described here.